Two teams with big-time playoff aspirations tipoff in an early afternoon affair as the undefeated Denver Broncos take on the Baltimore Ravens in Baltimore. Denver has won the last two contests between these two teams, most recently in September 2015, a 19-13 victory. The Broncos are tied for first in the AFC West at 2-0, while the Baltimore Ravens are tied for second in the AFC North at 1-1. The Oakland Raiders jumped out to a 12-0 lead before the half, but could not hold it, as the Denver Broncos battles back with 13 straight points. That included a field goal with six seconds left to give Denver the 20-19 victory. Mike Nugent hit two field goals but would miss the after point after Marshawn Lynch scored with 35 seconds left in the half to give the Oakland Raiders a 12-0 lead heading into the half. Denver was doing nothing early on as Case Keenum was struggling. However, in the second half, Keenum would come alive. With a little less than six minutes gone, Royce Freeman scored from one yard out to cut the deficit to five. Derek Carr, who completed 29 of his 32 passes in the game, found Seth Roberts for a 20-yard touchdown pass to extend the lead back to 12. A 39-yard field goal by Brandon McManus made it 19-10. Keenum then scored from one yard out with a little less than six minutes left in the game to pull Denver within two. That set up for the dramatic ending, where the Broncos moved to the 18. McManus then hit a 36 yarder with six seconds left to give the Broncos the victory. Phillip Lindsay rushed for 107 yards on 14 carries. Case Keenum completed 19 of 35 passes for 222 yards. Andy Dalton threw for four first-half touchdowns on Sunday to lead the Cincinnati Bengals to a 34-23 victory over the Baltimore Ravens. Joe Flacco threw for 376 yards and 2 touchdowns in the loss. The Bengals opened with three unanswered touchdowns by Dalton to jump out to a 21-0 lead. All three went to A.J. Green. Javorius Allen scored from one yard out to put Baltimore on the board. Dalton extended the lead back to 21 with a 14-yard touchdown pass to Tyler Boyd. Flacco found Mark Andrews for a one-yard touchdown with eight seconds left in the half to make it 28-14. Baltimore came out of the locker room and would add three points on a 55-yard field goal by Justin Tucker. Flacco then completed a 21-yard touchdown pass to John Brown to make it 28-23. However, Cincinnati would get two field goals from Randy Bullock to close out the scoring. 7-2-2 ATS in their last 11 September games. 2-8 ATS in their last 10 games against AFC teams. 1-9 ATS in their last 10 games on the road. 4-1-1 ATS in their last six games against a team with a winning record. 3-7 ATS in their last 10 games on turf. Despite giving up 34 points to Cincinnati, this is a pretty good Baltimore defense. Keenum has been solid but he is not Andy Dalton and the Ravens are at home. This should be a fairly decisive victory for the Ravens in this game. The favorite has won gone 6-1 ATS in the last seven meetings between these two teams. 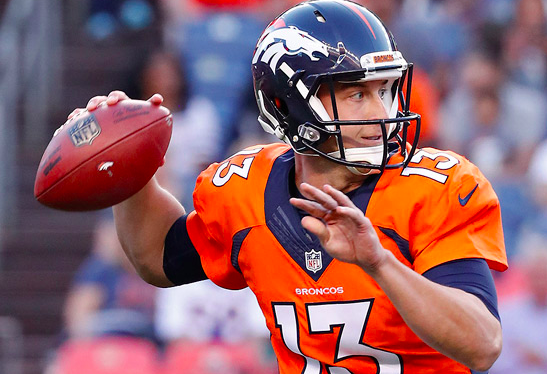 The home team is 5-2 ATS in the last seven meetings and the Broncos are only 1-5 ATS in the last six in Baltimore. The total is at 43.5 and that is a pretty good bet as this should be a low scoring affair. The likelihood is that Denver scores no more than 14 points in this game, so the under becomes the smart bet in a 27-14 game.